Barbara M. Hallman, Art and Music: Who's the Stiff? I recently finished a gourd Sun Conure (parrot) for a former student. I've made birds before including a quail but each one seems to have it's own unique challenges. With this one I was having balance issues and had to use a glue and sand mixture inserted into the "belly" to balance out the weight of the wings. 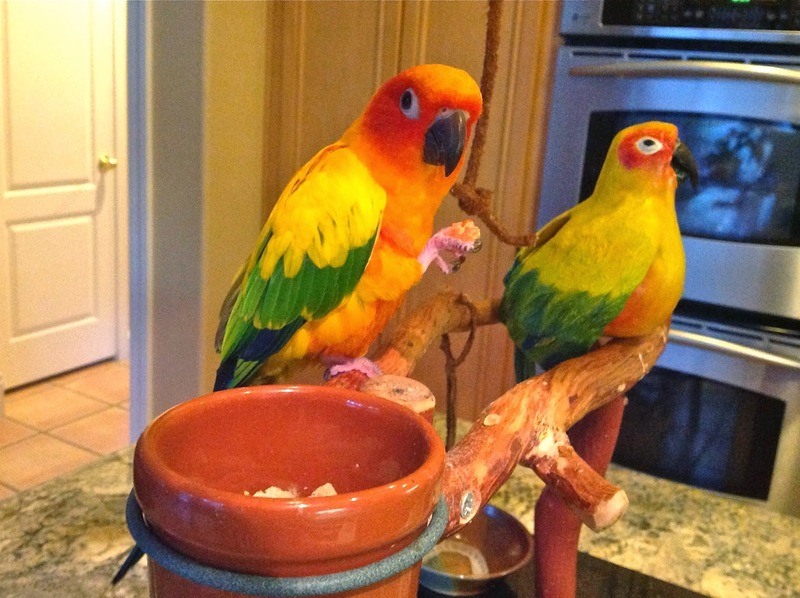 I thought it turned out pretty good until he sent me a picture of his pet parrot, Comet, next to the gourd parrot. Well, mine looks pretty stiff compared to the real thing, but what I really love about this picture is Comet's expression! For your information, I am having problems picking out the gourd from the real thing.....great job Barb!